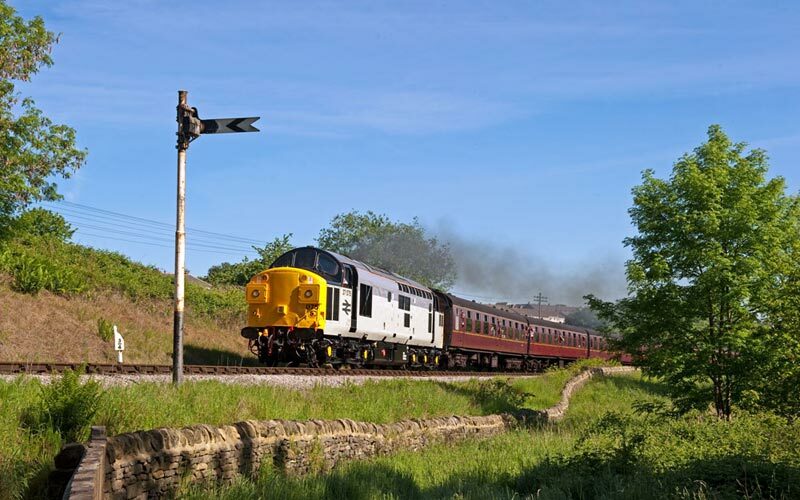 This weekend sees the last of the Diesel & Ale Saturdays when a 2 train service will be in operation with the diesel service in the hands of Class 37 37 075, operating a revised GREEN timetable. A selection of real ales will be on offer in the buffet car, sponsored by Naylor’s Brewery from Cross Hills. The steam service will have USATC S160 2-8-0 5820 at its head. On Sunday the BLUE timetable is in operation. The first train departs Oxenhope each day at 10.15 and the last departure of the day is 17.15 from Keighley. 5820 continues on Sunday and being joined by Ivatt 2-6-2T 41241. Work continues to increase the height of the north end of Haworth platform, approximately 180ft, so this area is once again out of bounds to visitors and permit holders wishing to access the trackside, from Haworth Station. This restriction will continue until all reconstruction work has been completed. Once again the Saturday early morning diesel railcar service will be in the hands of our Class 101 diesel multiple unit and this will also operate the 6 round trips on Wednesday. Many of our passengers just like to ‘drop in’ when passing – but I guess not when they are taking off from Leeds / Bradford Airport.